This was fun as always, and a storm of bookselling for us. In spite of the snow and icy pavements there were still plenty of folk out and about who came to share a mince pie and glass of refreshment with us while doing some Christmas shopping - although it was very early this year! Lovely feedback from folk about what a splendidly fun evening it is in Biggar. Don't Judge a Book by it's Cover. Atksinon-Pryce hosted an evening for See Me Scotland, with talks, readings, cake and discussion about mental health. It was a pleasure to welcome this lively and engaging group for an evening which proved interesting, informative, and fun. Many people struggling with mental health find bookshops to be safe places and the Atkinson-Pryce team is delighted to have increased their knowledge and awareness on this all important subject. We look forward to working with See Me Scotland again. Children's illustrator and author Morag Hood was at Biggar Library at 1.30pm for storytelling from her lovely picture books, and hands on drawing as well. Her latest book "I Am Bat" encouraged everyone to try their hand at drawing Bat with some fun results. A most enjoyable event. Barrington Stoke. Atkinson-Pryce hosted an event at Biggar Library with the very excellent Barrington Stoke, publishers of super-readable books. Specialising in publishing books for children who struggle with reading, they have been in business for 20 years and are going from strength to strength, attracting major authors and illustrators. Kisten Lamb from Barrington Stoke gave an informative talk about their work and it was a fascinating evening, well-attended by teachers, librarians and parents wishing to learn more. BLOODY SCOTLAND at Biggar Library. 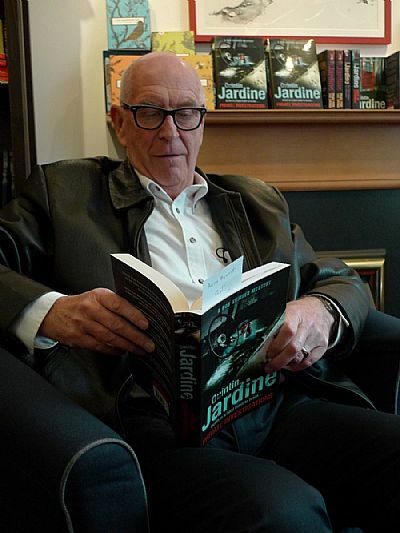 Celebrating the publication of Bloody Scotland an anthology of stories by twelve of Scotland’s best crime writers, Atkinson-Pryce hosted an event with a selection of the contributing authors, including Lin Anderson, Sara Sheridan, ES Thomson and Doug Johnstone. A good turnout of crime fiction fans were entertained by the four authors and the stories of the creation of their contriubtions as well as a general discussion on the nature of crime fiction. Hang on a tic... it's Just a Minute at the Corn Exchange, Biggar. A crafty combobulation, a whirligig of wicked wit, a perfect pot-pourri of paronomasia from our peerless panel. And all without repetition, hesitation or deviation... but with fun and laughter aplenty. A huge success again - with many thanks to our hosts, David and Alison Bishop, and our peerless panel consisting of Robin Laing, Hazel Gourlay, Helen McAlpine and Anthony Bowers. Patrick Barkham at Atkinson-Pryce. Author Patrick Barkham joined us in the sitting room at Atkinson-Pryce for a celebration of the publication of his latest book, "A Journey Around Our Archipelago”, which explores the outlying islands of our nation race. He entertained a full house with stories of journeys to his chosen islands and a presentation of lovely images. 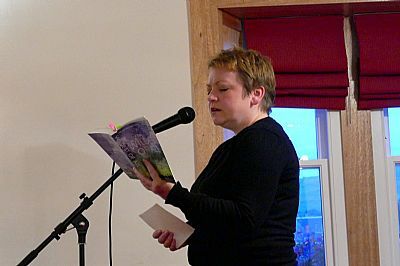 Debi Gliori at Biggar Library. Atkinson-Pryce Books is welcomed children’s author and illustrator Debi Gliori to Biggar Library for a talk and workshop. Creator of such wonderful books as "The Scariest Thing of All”, "Dragon loves Penguin” and "No Matter What”, Debi loves to communicate her passion for illustration with children and had a good crowd of small people to entertain. Who Built Scotland at the Corn Exchange, Biggar. Atkinson-Pryce hosted a celebration of the publication of "Who Built Scotland: A History of the Nation in Twenty-Five Buildings”. Three of the contributing authors, James Crawford, Alexander McCall Smith and James Robertson joined us to talk about their choices in this remarkable new book. As one of the audience commented "It was like being in a cosy sitting room with them having a chat" A lovely, relaxed and intimate evening in the Corn Exchange to a sell-out crowd. Crime writer Catriona McPherson was in Biggar for a visit to Atkinson-Pryce to discuss her latest Dandy Gilver adventure "Dandy Gilver & a Spot of Toil & Trouble", plus her new stand-alone crime novel "The Weight of Angels". The author entertained us with stories from her writing life including the special challenges if living in California but still setting her books in her native Scotland. Always a delight to host Catriona with her wit, insight and humour. "The Weight of Angels" is McPherson's best yet' - Karin Slaughter, New York Times and International Bestselling author. 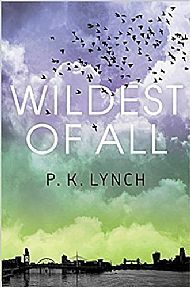 Pauline Lynch was at the Elphinstone Hotel for the launch of her new novel "Wildest of All". Pauline entertained us all with readings from the book as well as stories about its creation, both funny and moving. Sponsored by Legend press, the wine flowed, as well as the words, which contributed to a delightful evening for our talented local novelist. Signed copies now in stock. Published by Legend Press at £8.99. Beyond Borders International Festival of Literature and Thought at Traquair House is the most fascinating weekend of the year for us! 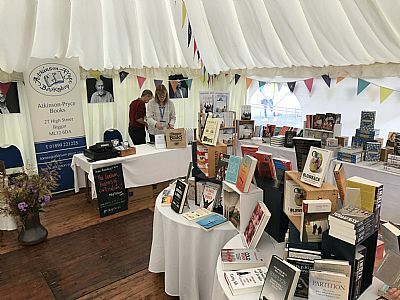 We are always delighted to run the pop-up bookshop for the festival and this year the range of authors and speakers was brilliant - great books and great people. It is a lovely relaxed atmosphere and if you have never been before put the dates in your diary for next year! Bella Bathurst was our guest in conversation with Jo Macsween at The Elphinstone Hotel with her recently published book "Sound". It was a truly fascinating evening all about the nature of sound and hearing. 11 million people in this country are affected by hearing loss, and yet it is a much neglected subject. "Sound" is not only a revealing study of many aspects of it but is also a memoir of the author's experience of losing, and regaining, her own hearing. Her description of the experience was moving and articulate, as is indeed the book itself. 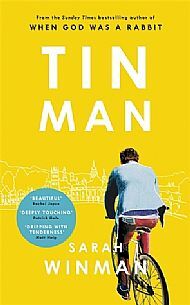 Best-selling author Sarah Winman joined us at Atkinson-Pryce for a delightful evening with her beautiful new book 'Tin Man'. She entertained the audience with readings and stories of the creation of Tin Man, and also her journey to becoming an author. After the huge success of 'When God Was a Rabbit' and 'A Year of Marvellous Ways' Sarah has created a love letter to human kindness and friendship. This novel is tender and unforgettable. 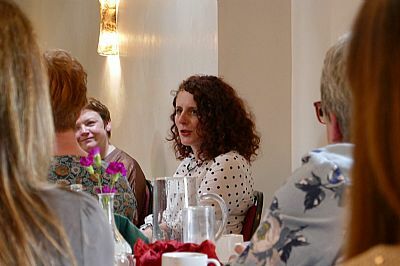 Maggie O'Farrell joined us in the Elphinstone Hotel for a delicious literary Lunch and fascinating conversation about her writing and her latest paperback 'This Must Be the Place'. 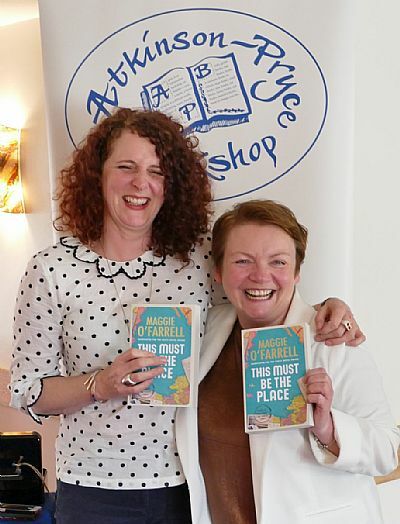 We were delighted that local author Pauline Lynch was able to chair the event, which was lively and enjoyable. A HUGE thank you to everyone that came along to support this event which was a roaring success! Great company, wonderful speakers, a huge raffle and most importantly delicious food. 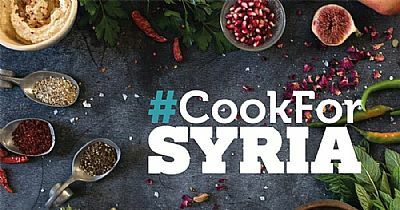 It was an evening to celebrate Syrian cuisine and to support and raise awareness for the humanitarian crisis happening right now in Syria. We were supported very generously by local friends, businesses and publishers, for which we thank you. A whopping £1,300 was raised and is being donted to Unicef's Children of Syria fund. We had a wonderful evening and hope that everyone enjoyed it! Local expert David Bishop and illustrator Colin MacNeil visited Biggar Library to talk about the revised and expanded edition of 'Thrill-Power Overload' - the definitive history of the most influential comic ever. Special thanks to Judge Dredd who made an appearance!